As Source readers already know, one of many eagerly sought Measure M transit projects is a northern extension of the Crenshaw/LAX Line. 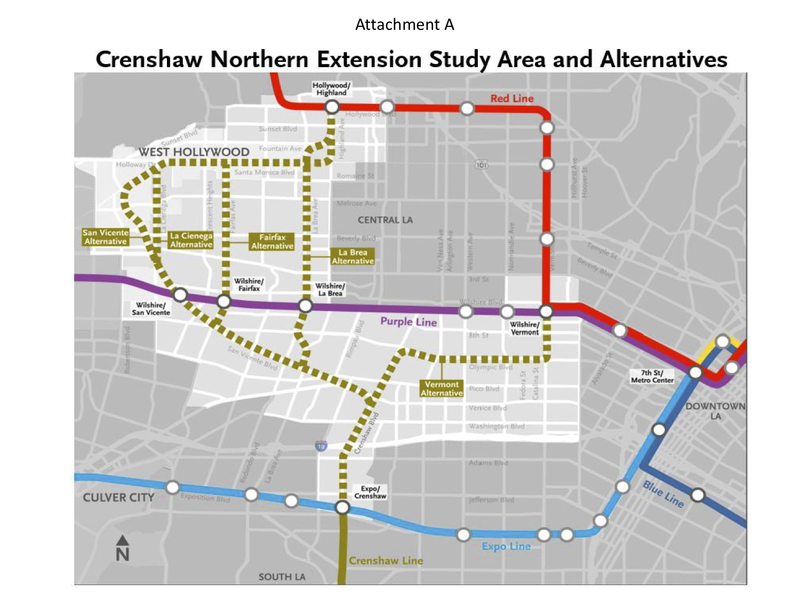 Metro has released a staff report and Feasibility Study/Alternatives Analysis for the project that looks at five potential light rail routes: four would extend the Crenshaw/LAX Line north to the Purple Line and then through West Hollywood to the Red Line in Hollywood and one to the Red/Purple Line at Vermont Avenue and Wilshire Boulevard. The Crenshaw/LAX Line is an 8.5-mile light rail line that is currently under construction between the Green Line and the Expo Line. 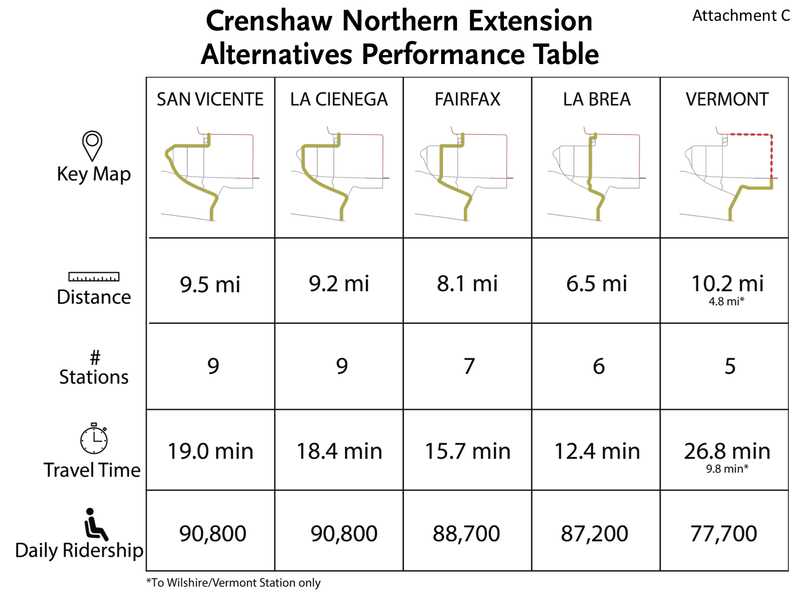 A northern extension of the Crenshaw Line was looked at as part of the planning studies for the Crenshaw/LAX Line but the funding wasn’t available at that time. Under the Measure M spending plan, the northern extension has a targeted groundbreaking date of fiscal year 2041 with an opening in 2047 unless the project is accelerated. There has been a long-standing interest among West Hollywood local elected officials and stakeholders to accelerate the delivery of the Crenshaw Northern Extension.Within the provisions allowed under Measure M, Metro staff has committed to exploring a viable path forward to accelerate the project, consistent with adopted Board policy:Early Project Delivery Strategy. 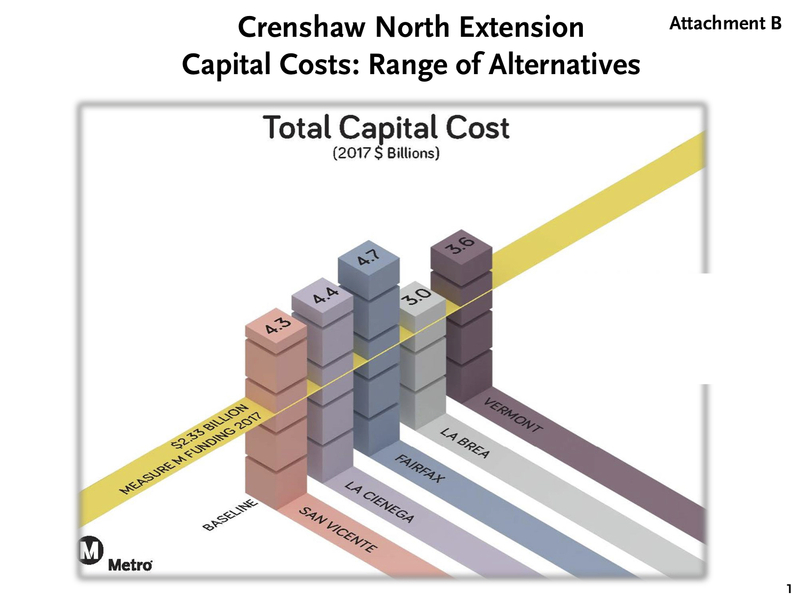 A significant finding emerging out of the Feasibility/Alternatives Analysis Study done to date is the fact that the cost of all five alternatives exceed Measure M funding allocations, some by approximately double. Any potential acceleration strategy at this juncture would have to address that factor, either through mitigating cost, securing new revenue, or a hybrid of both.To better target project delivery options and a funding strategy, there is a need to conduct broad public outreach and potential further technical study to prepare for a next stage of environmental review. Staff will consult with the cities of Los Angeles and West Hollywood to develop a strategy of next steps and attendant schedules for the next stage analyses. Metro staff is targeting to return to the Board in September, contingent on the city consultative process. What do you think of the alternatives, readers? Comment please. It’s also worth adding that Metro will be conducting a significant amount of public outreach on the project as it moves along. Below are pages from the Feasibility/Alternatives Analysis on each of the different routes (click to see larger). A slide on costs is at bottom. It was very apparent to me long ago that West Hollywood would get little relief if not none from the Crenshaw extension. This study confirms my belief. And a light rail line even from San Vicente to La Brea will do little to relieve the huge grid locks this east-west corridor experiences everyday. The MTA is a joke. Like the former LACTC their main goal is not to provide fast efficient public transit but instead to build light rail where the political winds take them at the time. West Hollywood is a small city with little political influence ran by naive politicians that will believe anything the MTA will tell them. This last appeal for an increase in the sales tax included a promise of light rail and they believed the MTA that the San Vicente extension would be built. Now we see that is the least desired route. I understand that in the past metro had to make something out of nothing and kicking and screaming you presented us with the orange line and that was a great success. The orange line really should have served as a lesson for both Metro and the county. Metro needs to get it right from the start because since then it’s been crap. You can’t build at grade in this city it improves nothing. I envision nothing but heavy rail along Santa Monica Blvd anything else would be a joke. Metro there is no excuse for lack of funding anymore. If your going to build something build it right from the start. Don’t leave it for us to figure out in the future (blue line between 7th and Washington *cough cough). Your putting band-aids all over the county. I would prefer you built nothing rather then spend out money on another Expo Line. The point is to make travel FASTER. I’m willing to make the investment. Who’s with me? I agree 100%. The Expo Line should of been subway. As light rail, it is very slow and a prone to car accidents. It defeats the purpose of taking the train. All major European cities have an extensive and fast subway system. Light rail should be last resort not first choice. Scrap the Gold Line extension to the Inland Empire and use those funds to build a subway system in West Los Angeles ASAP. The Inland Empire already has Metrolink service. Los Angeles County has a population of 10.1 million!! However, the priority is to build light rail to the Inland Empire?!?!? Did either of you read the route descriptions? All of the proposed extension route are mostly grade separated through either aerial or subway grades. The only place where the line would run at grade would be on San Vincente Blvd, and only for a short portion of that segment. While I agree that the Gold line extension isn’t necessarily the best choice, the design options for the Crenshaw extension seem to be well thought out. So because Montclair is getting only 1 station, suddenly the entire Inland empire gets to benefit from it?? I’m just trying to understand the logic with that one, as the Montclair station could never the capacity to serve the entire Inland Empire. Also, the Vermont, La Brea and Fairfax options are almost entirely Grade Separated and the 2nd Promise of WeHo getting a “Light Rail Subway” is there. Lastly, even if this line were to become heavy rail, it will require a transfer now. . . Soooo, how would that be beneficial?? Look at the bigger picture, there are plans to extend the Gold Line to the Ontario airport (Phase 3). I never said it will have the capacity to serve the entire Inland Empire. Metrolink already provides the capacity to serve all of the Inland Empire. Why prioritize a rail extension to an area that already has rail services (Metrolink)?? West Los Angeles is in dire need of an efficient rail system. Have you ever tried sitting in traffic during rush hour and move 10 miles in one hour?? The logic is: prioritize rail where it is needed the most and not where there is an existing rail system. It is common sense. “Almost entirely Grade Separated” is not good enough. Do it right 100% from the beginning. Even if the Gold Line were to go to Ontario Airport (and that’s a big IF), that construction phase would be financed by San Bernardino County. From Montclair eastward, Metro’s not responsible for construction costs. When the Expo Line was planned, funding subway construction was illegal based on a 1998 proposition. Expo was selected for light rail as the right-of-way already existed. Light rail works fine, provided there’s adequate grade separation. Riding the Expo eastbound, things are fine until you hit Farmdale, then the aggravation begins. Grade separating Flower (and maybe Western and Vermont) will help. As for the Inland Empire, to get the sales tax increase approved, each area of the county had to have some project. Similar to Expo, the right-of-way exists so this mostly at-grade extension is low hanging fruit. Hopefully the Inland Empire will be wise and not build a redundant rail system. I am sure they can find other ways to help their community with that money. I disagree with the “low hanging fruit” mentality that Metro seems to embrace. Metro should strive to achieve maximum potential and for that you must have a long-term-perspective and not seek instant gratification. Low hanging fruit is nothing more than played-out sales and marketing jargon to find a short-term fix. Metro should put in the extra effort and step out of their comfort zone and build a rail system on par with the best in the world. I doubt the Europeans or Japanese achieved their rail system with a “low handing fruit” mentality. Don’t forget, gated crossings are just as fast for the trains as grade separations. The problem is signal-controlled crossings where the city doesn’t give the trains enough priority. The problem with gated crossings is the traffic it generates for cars. For example, the intersection of South California Avenue and East Duarte Road in the city of Monrovia. The trains have right-of-way along that section of the Gold Line, which is great for the train commuters. However, it is the complete opposite if you are driving northbound to get on the 210 freeway. I’ve been stuck at that intersection for well over 10 minutes waiting for the trains to pass. At peak service, trains are running every 10 minutes or so in both directions. It is easy to see the repercussions of gated crossings. As a community we need to hold Metro accountable for these issues and demand the ability to enable people to move more effectively throughout the region. But we all need to demand it. After-all, it is our tax money that they are spending. La Brea & Fairfax are my top choices! La Cienega 3rd choice. It should be Vermont AND one of the other options. Both. I am interested in the La Brea Alternative. Bunch of grumps on here tonight! Anyways, I agree with Bin Lee, La Brea and Fairfax are my choices. Fairfax would be a boon for all the points of interest (read: tourist stops) along the way. Maybe finally one can avoid the parking nightmare at the Grove and Farmer’s market on the weekends with light rail stopping next door. That walk from Wilshire is not a pleasant one for sure. La Brea would be the best for speed and future development along that corridor, but it misses most places people want to go in West Hollywood. Should really be a stop at Melrose. One day there really should be a future line that shares track with the Crenshaw line that splits off at San Vicente, continues along San Vicente, and terminates at San Vicente and Santa Monica. Then perhaps further into the future an East-West Line along Santa Monica could be built that could link up Downtown-Echo Park-Silverlake with the Red, Crenshaw, and San Vicente lines. One can dream, I guess. . . .
My personal preference would be La Brea, since its (a) the fastest route to Hollywood/Highland, (b) hits more areas that appeal to ME, and (c) it’s the cheapest option, conserving resources for other projects and hopefully shortening the timetable to completion. Second choice would be La Cienega – highest ridership projection and access to restaurants/Beverly Center/Cedars, which doesn’t appeal to me personally but seems like the best use of public funds. I’m surprised that the Vermont option has the lowest projected ridership – would have expected the opposite. Except for this extension, I dont think there will be any other line in this section of central LA for 30+ years. So this Northern Crenshaw line extension is the only rail going in for a long long time. There are just so many expensive projects in the wait list. Includes the Sepulveda line, ESFV, Gold Line extension, The DTLA-Gateways cities line, , Whittier or El Monte line. Vermont Line, Torrance extension, Green line metro link extension. NoHo to Pasadena BRT, I might be missing something else. Anyway, there is limited future transit capitol building money to go around. Thats why so many projects on the wait list. So when it comes to this project there is probably only this project in the near future. I choose La Cienega. It goes to as many locations and connects as many communities that people go to and live in. People drive all over to get to the shopping of the Beverly Grove/Fairfax/Melrose Area. People drive from all over to get to nightlife areas of West Hollywoods Boyztown and sunset strip. While The Grove another popular area is a longer walk to A Purple wilshire or La Cienega stop, it still can be done in 15 minutes or less. This route also goes through some very high density residential and high rise commericial areas compared to la Brea ave. That type of development is limited to La Brea Ave, but the streets behind are mostly low density and single family home zones. So forget about getting higher density in that corridor. Why do people like La Brea? Cuz its cheaper or faster? Who does it benefit? I doubt tourists benefit since so many who are staying in Hollywood want to go places like Beverly Center, The Grove, WeHo, Sunset Strip. For locals? Where do they want to go? Are people just interested a fast way to get from Crenshaw and South bay to Hollywood? La Brea looks like it makes the most sense. Fairfax has slightly higher ridership, but for 1.7 billion dollars extra! Those would most expensive extra riders Metro has ever pursued. I think the best option is La Brea, and use the extra money to start work on an East West Line on Santa Monica Blvd. 1.7 billion is almost enough to go from Santa Monica/La Brea to Wilshire/Rodeo with stations at Fairfax, La Cienega, and Doheny. Later the line could be extended east to Vermont and then follow Sunset to Downtown. Uhh, Have fun convincing Beverly Hills why they should accept a second subway through their city when they are still actively trying to stop the Purple Line as we speak. To me, Fairfax is best balance of speed, cost and utility. But that’s just, like, my opinion man. I vote Fairfax as it is in the middle of the alternatives and the east side of La Brea is unlikely to see the development needed to maximize the investment in rail infrastructure. Why not also consider elevated structures in lieu of subways? This would materially reduce the costs. Among other things, the loss of street travel lanes is far less than medians now used to separate the trains from other traffic. They could even place the support pillars in the sidewalks to eliminate the impact on automobile traffic. I lean towards either the La Cienega or San Vincente alternatives as they maximize the ridership potential, as well as maximizing service to West Hollywood. The Vermont option is a non-starter. Koreatown has its fair share of rail, especially if you include a future line south down Vermont. Of the options that touches West Hollywood, Fairfax seems to make the most sense. The decision on routing should wait until the Sepulveda route is selected. If the Purple Line is extended to LAX, that would relieve pressure from the Crenshaw Line, which would make a San Vicente routing more palatable. Fairfax route appears to be the best reason to use Metro especially having the Grove within walking distance to a stop. Vermont is the worst since it doesn’t gain new customers, who can already detour through the Expo Line. La Brea would make the most sense to complete a great grid-like rail system, ASSUMING something along San Vicente is also built.. but as mentioned elsewhere, that might be a long time coming. If we think future oriented, it’d be great to have more of a balanced east-west and north-south rail grid versus the awkward path that San Vicente or even La Cienaga alone would create. I think that the Fairfax route is THE way to go. It’s the perfect middle ground in terms of being a slightly more direct route to the Hollywood and Highland Red Line station compared with La Cienega and San Vicente, but also hits two major attractions unlike La Brea and Vermont. A Fairfax rail route would finally give the car congested Grove another transportation option, and residents or visitors going to tapings at CBS next door (notably The Price Is Right), no longer have to pay ridiculous parking prices at The Grove to attend tapings (as CBS doesn’t allow regular parking in their lot). Also, Cedars-Sinai and The Beverly Center are either walkable, or a short lyft/uber ride away. Remember when the Purple Line extension was being planned it included a potential branch up Santa Monica Blvd. to Hollywood? But that seemed better as a north-south line continuing south of Wilshire, which is now the northern extension of the Crenshaw Line. The eastern location of the La Cienega Purple Line station also was done to be convenient to a new San Vicente alignment if ultimately built. Also think how difficult is it to get to the West Hollywood area — getting there involves a long slog along a boulevard from the 10 or 101 freeways — and how strongly West Hollywood has supported Measures R, J, and M.
I’m also surprised that the capital cost for San Vicente is less than La Cienega and Fairfax. And Vermont is just silly, not serving north of Wilshire at all, a longer version of the old Crenshaw route to Wilshire/Western. I’m for serving West Hollywood well, with a route up San Vicente (a former Pacific Electric Red Car route, after all). The result will be a very useful large grid across the Westside, with east-west and north-south lines making a 3-mile grid. San Vicente! I’d love to see an underground station at Wilshire/La Cienga/San Vicente making one big Purple/Crenshaw transfer station. Also love to see the tracks extended to Hollywood bowl maybe to be used as shuttle service for Concerts and train storage while not in use. A smooth transfer between the Crenshaw and Purple lines is critical. Connections are *key* to a metro system. A bad connection at Wilshire Blvd. is a non-starter. If one of the WeHo options (La Cienega or San Vicente) is selected, Metro *must* locate the station underground, close to the Purple Line station, connected by a direct underground passage. To put it another way, I would actively oppose (and campaign against) an aerial station at Wilshire/San Vicente, four long blocks away from the Purple Line station. An aerial station four blocks away is not a transfer. It is a ten-minute connection involving a five-minute walk and two long elevator rides. I agree about the connection concern. The Red Line to Gold Line transfer at Union Station (which will become less used when the Regional Connector opens) is a glaring example of a rough connection. I’ll wait to see when Crenshaw opens to see how the Expo transfer works. The concept of an aerial terminus station at H&H under the LaBrea version would add additional foot traffic to sidewalks that are already overstressed. If Metro would rule out the Vermont option, this project could be built/funded in two phases: Expo to Rimpau (as all other routes follow the same path). And Rimpau north. This allows time for the inevitable battles over the final northern alignment. Fairfax is clearly the worst option (because the Vermont option is a joke) of these. We should eliminate immediately simply on the cost-per mile basis. We should never be building any rail line that costs over 500 million per mile. Fairfax’s is WAY above that, completely not worth it. how much would just the one transfer station at the purple line cost, over a billion dollars? And the only major employment center on fairfax–CBS televsion city–is being sold to be redeveloped into ultra high end condos for the global super elites. F that, they don’t need rail and they won’t use rail. No more jobs or employment center there! ELEVATE LA BREA! is my vote, pretty great option, 12 minutes to get across town, which is phenomenal. Speed matters. San Vicente is the best jobs destination, but really, a Santa Monica blvd, east west line ought to be in the long range plan cards to serve this need. serves the most households that do not own a car. The street is wide enough that bents for an entirely elevated line will not add further congestion to SOV movements. is being redeveloped the most and in the future. Fly High to Hollywood! Elevate La Brea! @metrocenter — the La Cienega station platform is on the east side of La Cienega, and I’d think it not too hard to build a second entrance on the block next to San Vicente. 2 lines need to be done — the straight shot up La Brea for the very long Crenshaw line- if this line is one day going to go Hollywood to Torrance/Long Beach/San Pedro, it needs to be fairly straight just from an operational standpoint. AND then another line starting at the same stub end terminal Hollywood/Highland West along Santa Monica blvd, South down La Cienega to Venice and then Venice to the beach. This second line would have transfers to the Red, Purple, Expo, at Venice/Sepulveda for whatever future SFV- LAX line there is and maybe another major transfer at Venice/Lincoln for whatever project comes up and down Lincoln. May take longer in the end, but the end result would be better with a lot more transfer options. Couple of thoughts. I think there needs to be a broader plan for future. It’s hard to think about which one is best if you don’t take into account future options. My thought is La Brea. Hopefully that route could be extended to go up and terminate the Hollywood Bowl. That extension could be used for events and when events aren’t going on, it can be the turn-around. Eventually, there should be a red line extension down Santa Monica (similar to the Purple Line proposal). That would handle the West Hollywood traffic. Coupled with an eventual extension down Vermont, I think that would give the greatest coverage to the most places and distributed appropriately. The money saved by doing La Brea over Fairfax (1.7 billion+) is almsot 2 miles of heavy rail for a red line extension. Excuse my langauge, but the hell with the other 3 alternative rail options. I’d rather have Metro go for the ‘San Vicente alternative,’ since it makes sense to extend that proposed route, due to its history of an earlier street railway that ran on that boulevard and, of course… it’s wide enugh to accommodate a light rail line. I support the La Brea or Fairfax alignments, in that order. The La Brea alignment is mostly underground, offers major time savings over driving, is mostly funded (and I am confident the remainder could be obtained without federal grants), and has a very small ridership loss for a vast amount of money saved. -The alignments with significant at-grade and aerial sections will face endless lawsuits from NIMBY areas like Carthay. This will likely delay and drive up the cost of those alignments beyond Metro’s projections. -I do not support surrendering to NIMBY’s (the opposite, really). I am saying Metro should pick its battles. Should Metro delay the Northern Extension of this line for political reasons to appease West Hollywood because it will take longer to fill a large funding hole for the La Ciénega and San Vicente alignments, then face potential lawsuit delays? No, not for 4,000 riders a day. -Yes, the western end of West Hollywood and Beverly Center are strong candidates for Metro Rail, as is the Sunset Strip. It does not make sense to add those destinations to this line, though. They would be an awkward elbow on the route that drives up the cost and causes delays to completing the project for relatively few additional riders. It would be inconvenient and time-consuming for tourists, workers, and visitors to take one train from Beverly Center or West Hollywood, then transfer at Hollywood and Highland. Many would take Uber/Lyft instead. They should be part of an east-west line parallel to the Purple Line along 3rd St., Beverly, or Santa Monica to Downtown LA. Remember that original plans were to have a branch of the purple line run under San Vicente connecting to the red line back when measure J was proposed. It failed so that connection was cut from plans due to cost unfortunately and therefore West Hollywood got the shaft. This line attempts to replace it more or less as there is an opportunity for building such a line through that part of the LA area. Ideally, we would have that San Vicente purple line segment being built and then this line could simply run straight up La Brea. Since we are trying to accomplish what ideally would be two lines, than I’d say the Fairfax option seems to have the best balance in terms of both coverage and speed. It is tempting to want to build, though, where the many cultural and employment centers near La Cienega are, like Cedars Sinai, Pacific Design Center, being closer to the sunset strip etc. as the purple line spur or “pink line” would have. The Wilshire / Vermont terminus option is a non starter for obvious reasons. Now, the fact that the La Brea option is elevated is smart as it can provide the same safe high speed service as underground would but cut cost (and thus have funds to perhaps run an elevated spur towards west Hollywood / Beverly Hills). As for the Hollywood / Highland terminus, it ought to be underground no matter what as an elevated station connection would be much more transfer unfriendly and might mix foot traffic on sidewalks that are already crowded as others have mentioned. There might not be room to add a direct elevator or set of escalators directly down into the red line station. It would be nice if 4-car train platforms could be built for this line, but they would conflict with the crenshaw line’s 3 car platforms unless they were extended in the future (like the in-progress expansions on the green line from 2 to 3-car). Overall, the full or almost full grade separation is obviously the right way to build this line. The Fairfax option (north of Wilshire) should include an elevated alignment option as well. The short at-grade segment (s) along San Vicente ought to include full signal preemption whether gated or not. If crossing gate preemption can be included along San Vicente, all the better. Heck, if this segment could be trenched at the street crossings (like expo at Figueroa), that would be best thus making all of the proposals grade separated for low additional cost, but higher speed and eliminating the risk of accidents. I think the local leaders should first seek some of the state budget surplus to pay for the entire project. This area has waited far too long for rail transit. (Full disclosure, I live in NorCal but know the west side of LA needs traffic relief). Outside of that, I like the Fairfax option due to the cost, time, and area served. If this is going to happen under the accelerated timeline being paid for by West Hollywood, I think the La Cienega or San Vicente options are by far the best. The La Brea option has almost no benefit to West Hollywood (as the Purple line won’t be far away), and the Fairfax line benefit is significant more limited to West Hollywood. If the timeline for West Hollywood is going to be significantly accelerated using funding from West Hollywood, I think the La Cienega or San Vicente are the best options, plus it would give an opportunity for the bus depot in West Hollywood to be re-modeled and made into a more functional space. Pick the line that would best fit daily commuters, tourists, etc to balance budget while helping local businesses on that line. Look how NYC builds their lines. They have numerous stops, and never direct or express lines over any bridge. If Windsor Square NIMBYs hadn’t fought a Crenshaw stop on the Purple Line years ago, this would not be an issue. The Crenshaw line would end at Crenshaw and Wilshire. This would require a transfer for everyone except those in the low-density area, but it was already budgeted and could have worked. Instead we now have to fight over which station will have the greatest appeal or be tied to fantasy future extensions like the Hollywood Bowl. Letting go of the past now…The best option is Fairfax. Fairfax is a real hub. It has tourist attractions and businesses and is a logical starting point for a trip to LAX. Factor in a way to check luggage and travelers can visit museums and stores on their way to the airport. That said, I will probably be dead by the time you can get to the westside via subway from where I live. why not extend Crenshaw north to the Red Line at Wilshire? There’s already a staging area there so I suspect Metro owns the SW corner of Wilshire and Crenshaw. A lot going on there including Marciano Museum etc.